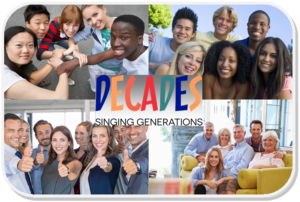 Decades, the new choir starts! On Thursday April 25th a new choir starts in Arnhem : Decades Arnhem. In every age group there will be place for 10 people. Students and people in their twenties twintigers sing for a reduced contribution. International students sing for free. Rehearsals take place every Thursday. The choir will perform in places where music is very much needed: in prisons, hospitals, jhomes for the elderly, and places in society where live music is seldom heard. Decades gives international students the opportunity to belong to a network and to join in a typically Dutch activity, together with Dutch locals: singing in a choir!